Chances are if you have been to a regional or national road race, or to a UCI stage race in the United States, you have heard the voice of Brad Sohner. 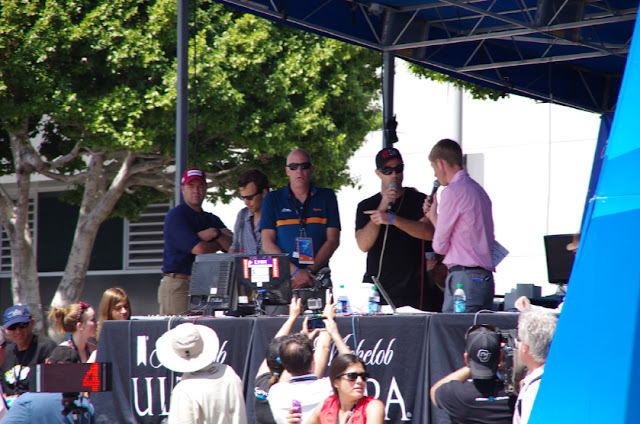 Brad was the announcer on the main stage at the recent Amgen Tour of California, the voice calling the race and introducing podium presenters and riders at stage starts and finishes. Brad Sohner sets the tone, maintains the pace, informs, educates, and builds excitement. I remember the first time I caught site of the man projecting that big voice, that is him, I thought, he is so young. How did he end up on that stage? How did he get so good so fast? Brad Sohner has an interesting story. At age 23 (today is his Birthday! ), I am impressed at how much he has already accomplished and how he came to step upon that stage. It was on Mother's Day, when Brad was 9 or 10-years old, that his Father, Mother, and two brothers happened upon a local mountain bike race, in a nearby park, on their way to brunch. Brad said with fond memory, "Having 3 boys in the car, we were quite excited about the prospect of riding bikes and getting money from it. My Mom, bless her heart, stopped the car and let us out of the van and we got to check out this mountain bike race, I thought it was the coolest thing in the world, and then started racing. Through those races I got my summer jobs working with an event company as part of the behind the scenes set-up crew at local bike races." "I was a roadie slinging fence"
Jamie Smith, of Medalist Sports, saw potential in Brad's strong voice one day at a race in Ohio and encouraged Brad to get on stage in front of a mic. Brad was 16 years old. The very next weekend Brad had a gig announcing in Detroit. Working at races kept Brad busy through his high school years. 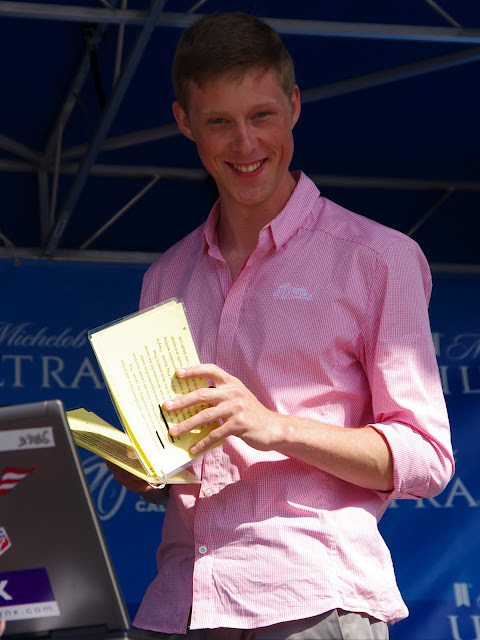 By 2007, Brad's senior year in high school, Jamie Smith offered him another position at the Tour de Georgia as his vocal public announcement assistant in the mobile PA car (the white car proceeding the caravan used to inform fans of the status of the race). The following year Brad joined Jamie Smith in the mobile PA car at the Tour of California. Medalist Sports organizes the Amgen Tour of California, the USA Pro Cycling Challenge, and the now defunct Tour de Georgia. Expanding roles in the other races was a natural progression. 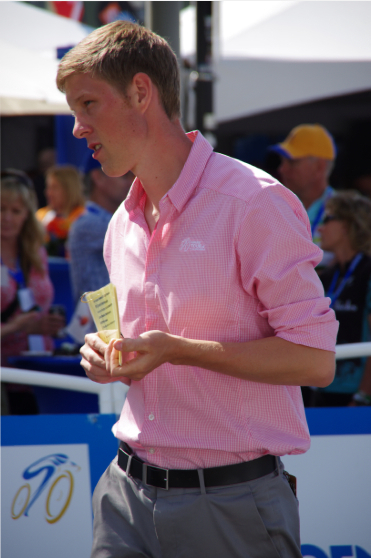 Studying at Ohio University, Brad completed his Bachelor's degree in Journalism in 2011, the same year he finally stepped onto the stage as Race Announcer at the Amgen Tour of California. The first ATOC Stage Brad announced was in Lake Tahoe, yes that stage - the one canceled shortly after it began due to snow conditions. "It was not how I pictured my first day on the big stage," Brad said. He went on to call the 2011 USA Pro Cycling Challenge in Colorado under sunny skies. 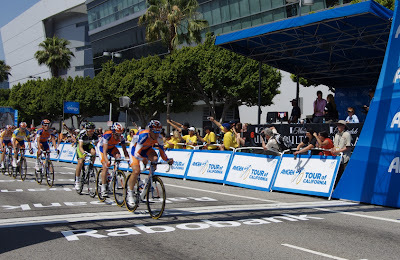 I watched Brad in 2011 at the Amgen Tour of California mesmerized at his concentration, rhythm and energy. He is a true talent. A talent that is being nurtured and developed, as important to this sport as any up and coming racer. Brad has the ability to create new long-term cycling fans, he influences those fans who come to watch races live for the first time. Those spectators we hope will return again next year because they enjoyed their day at the race and learned more about the sport of cycling. Ten years after working his way up the ladder, Brad Sohner will head to London this July to assist NBC in covering the 2012 Olympic Games. His role will be as a Spotter, assisting the NBC staff announcers in identifying riders in the road race. NBC will be using his knowledge rather than his voice this year, but at Brad's current pace, it might not be long before we see him announcing on NBC Sports. 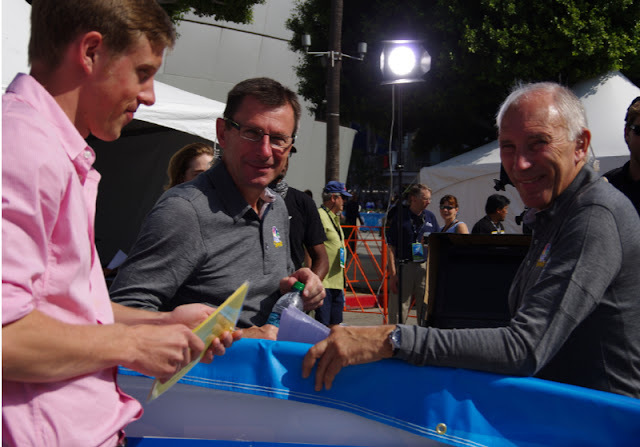 Working along with Dave Towle, an established voice of American cycling and an announcer at the Amgen Tour of California since it's inception, Brad and Dave often travel together working long hours. Brad Sohner now lives in Brooklyn, New York, with his girlfriend, a reporter. Dave Towle lives in Oregon, but the two pro announcers reunite at various jobs around the country on weekends. You can think of Brad and Dave as the onstage versions of Phil and Paul, their voices booming to fill the atmosphere for many surrounding blocks. I might like cycling, but I doubt I could come up with audible interesting content (in complete sentences) for 4-6 hours a day. Many of us realize our own commentary might not be air-worthy, the only words I seem to utter while watching a sprint are "Go go go!" I carelessly butcher riders names such as Tjallingii, Farrar, Irizar Aranburu, Devenyns, and Stamsnijder. It has taken me years to be able to identify riders on and off the bike. Fan: Is announcing your full-time job? Brad: Yes, pretty much year round, I will do cyclocross through the fall and winter, it is steady through January, then things tapper off and pick back up again in April. Fan: Do you announce other sports or events? Brad: I do a few things, I do maybe10 running races a year, 10Ks, marathons, and triathlons. Bike racing is definitely my bread and butter. Fan: Why did you pick cycling? Brad: Well, cycling picked me. It all started one day, driving in the car. (read story above). I fell in love with road racing watching the races where we would set-up the mountain bike races. Road racing was much faster and more technical than mountain biking and the athletes, both guys are girls, were more fit athletes ... so I took a liking to road racing after that. It became a long love affair with cycling. Fan: Do you ride yourself? Brad: Yes, I ride as much as I can. It is hard being on the road to get a whole lot of miles in, so I try not to take myself too seriously. I will always love a good bike ride. I am not much of a racer or endurance athlete, I just enjoy the thrill of being on a bike and enjoy the experience. Fan: Do you do other sports? Brad: Not really, I did some sports in grade school and high school but cycling is pretty much it. Bike racing was full-time for me by the time I was a junior or senior is high school. I was traveling quite a bit at that time. Fan: Do you listen to your own announcements and critique your work? Brad: Yes, I try to listen back as much as I can, for things that get repetitive or jokes that maybe don't work. I always try new stuff and new ways to explain things. The biggest thing I listen back for is clarity of information, because I think it is important to teach people about bike racing. So I go back to refine my explanation so I can explain it quickly and clearly. I am always trying to improve. 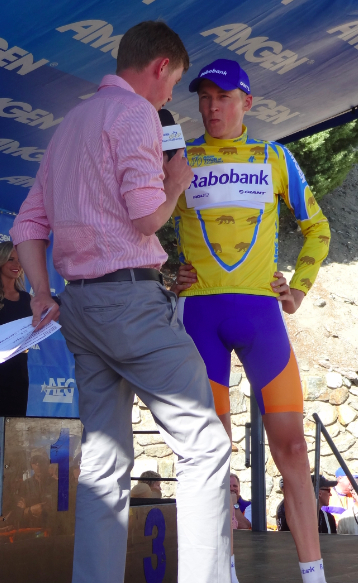 Fan: What is your favorite type of stage to announce a sprint finish, ITT, or climb? Brad: I think the mountain finishes are the best. I always like the stories of the one-in-a-million guys who makes in into a break and it sticks. I think that is a magical aspect of the sport of cycling. Sprints are always fun too. I would say the out of the ordinary incredible performance days are some of my favorites. Fan: How do you prepare? where do you get your information from? Brad: A lot of the information is provided by the teams: ht, wt, age, is all submitted by the teams. It is all database, when we get start lists we also get bios. I also keep my own database going. A lot of it is just knowing the riders and being around the riders. I have learned the most from hanging out with the riders in hotel lobbies or on shuttle buses. I think the biggest preparation for me is just being around bike racing as much as I can. Fan: After each stage do you read news reports, which sources to you use? Brad: This year I have noticed we are using a lot of Twitter, we can see what riders are talking about in a day's stage and we can ask them about it on the start stage the next day. The Jens Voigt story is a great story, where a bee landed on his lip and he swallowed the bee - that made for a great story on the start stage the next day. We try to read up as much as we can ... we try to stay as connected as we can on the road. Fan: How do you learn the correct pronunciation of the riders' names? Brad: I ask the riders, certainly at sign-in each day, and if it really gets down to it, right before the podium I will ask. A lot of them we obviously know, most of the names are familiar on the list, but you always get a first year rider .... a lot of research goes into it, we work really hard to make sure we get the names right in their native tongue. Fan: Is it Bow-nun or Boo-nen? Brad: Tom says "Bow-nun."" "If you ask Tom in his native language he will say it is "Tohm Bow-nun". But I think "Boo-nen" is equally acceptable. Jens Voigt is a great example, in German it is "Vokedt", but he is resigned to being "Voyt" in the States. Karen: I notice when you are on stage, you are watching the TV. How do you learn to quickly identify the riders? Brad: Yes, we have trained ourselves to do commentary from the stage. Trying to get the whole team down, all 8 riders, trying to hone in and pick out the quirks of the riders, weird things on their bikes, or sock heights, tall socks or short socks, things like that. You always look for little clues, little giveaways on certain riders. Fan: You were wearing matching shirts with other Key Staff members, do you have an apparel sponsor? Brad: Rapha provided all the staff clothing this year. Rapha is awesome performance inspired cycling wear. All the gear that we wore is cycling inspired - longer back and longer sleeves, perfect tweaks that make it awesome for riding but also looks good off the bike. The AEG Key Staff members, Phil and Paul, everyone was in Rapha. I love that stuff. Karen: If you could announce any event, what would you like to announce? Brad: I think to be at Paris-Roubaix would be one of the coolest experiences, to call in a rider on that velodrome after they had just accomplished a great feat of winning Paris-Roubaix. They get a couple celebration laps on the velodrome - to be able to share that moment with the rider would be awesome. Karen: Do you get feedback from the fans? Brad: All the time. Good and bad. I am always happy when people come up and tell me what they think. It is great to hear when a spectator has never been to a bike race before, and they say "I didn't think I would like it, but this is awesome." Even if you just get one person into bike racing. Karen: Will you be announcing again at the 2013 Amgen Tour of California? Brad: If something else came along, Tour of California would be the last thing to go on my calendar. I would be taking vacation days to come, I think I will be around ATOC for a long time to come. Karen: Where can we see you next? Brad: Greenville, NC - US Pro Road Championships this weekend. Then to Washington, DC for the Airforce Cycling Classic, then Nature Valley Grand Prix in Minnesota, then London Olympics in July. I will go right into the USA Pro Cycling Challenge after that, I am home for maybe 3 or 4 days in between. As soon as the bell rang at the start line, Brad was in the van, traveling the shortest distance to the finish line with Dave Towle and one assistant. 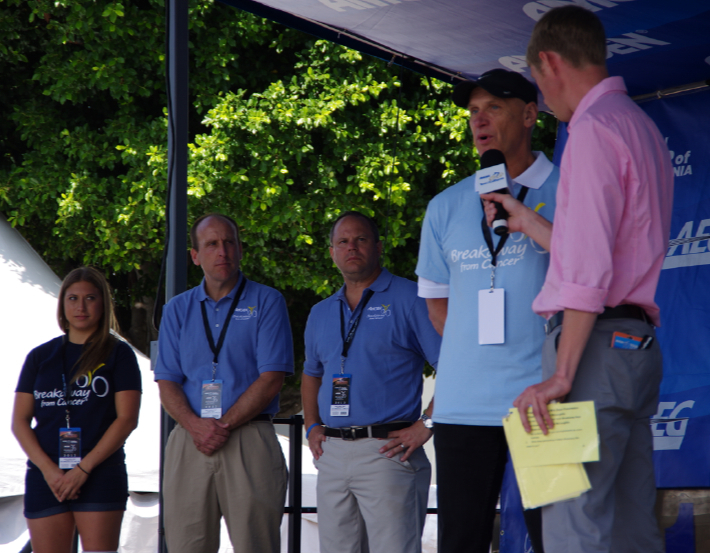 Brad said the operations behind the Tour of California were amazing and seamless. All arrangements were handled by Medalist Sports. All hotel reservations, rental car, gas card, GPS with all start lines, finish lines, and hotels were pre-programmed into the unit ahead of time. "It was an amazing week," Brad happily summarized.